Gardner Francis Cooper Fox was an American writer known best for creating numerous comic book characters for DC Comics. Comic book historians estimate that he wrote more than 4,000 comics stories, including 1,500 for DC Comics. Fox is known as the co-creator of DC Comics heroes the Flash, Hawkman, Doctor Fate and the original Sandman, and was the writer who first teamed those and other heroes as the Justice Society of America. Fox introduced the concept of the Multiverse to DC Comics in the 1961 story "Flash of Two Worlds!" Pseudonyms: Jefferson Cooper, Bart Sommers, Paul Dean, Ray Gardner, Lynna Cooper, Rod Gray, Larry Dean, Robert Starr, Don Blake, Ed Blake, Warner Blake, Michael Blake, Tex Blane, Willis Blane, Ed Carlisle, Edgar Weston, Te Gardner Francis Cooper Fox was an American writer known best for creating numerous comic book characters for DC Comics. 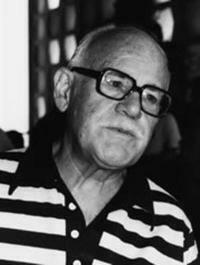 Comic book historians estimate that he wrote more than 4,000 comics stories, including 1,500 for DC Comics.